This is the all-inclusive Pearl Harbor Tour! All of the main five attractions are included with admissions. Prior to arrival at Pearl Harbor our trained professional guide will share a World War II narration. Our guides are also trained to share tips and hints on what to look for when visiting the five main attractions. A brief history about the USS Missouri is also given on the route to Ford Island. Lunch is included on this tour. This luxury tour is complemented with a tour of Honolulu’s historic sites narrated to provide important events of Hawaii’s history. Go beyond the call to duty with this full Pearl Harbor experience tour. Start your journey at the Pearl Harbor Visitor’s center where you can see various displays and museum exhibits about the history of World War II. All three museums at the Visitor's Center are accessible on this tour. Watch the USS Arizona memorial program, which begins with a short film highlighting the historical events leading up to and the attack on Pearl Harbor. Then, board a Navy shuttle to see the magnificent Memorial that rests above the sunken USS Arizona battleship to remember the 1,177 men still resting within. 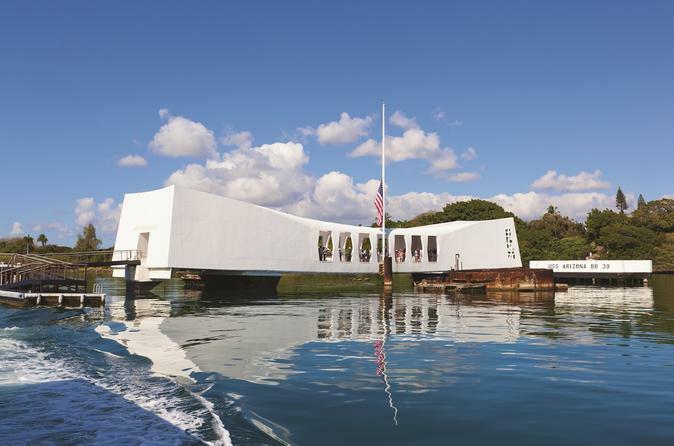 Included is the award-winning audio tour that will guide you through the Pearl Harbor Survivor segments while on board the USS Arizona memorial and provide a memorable “Path of Attack” tour along the shoreline. The USS Arizona memorial narrated tour is available in English, German, French, Spanish, Japanese, Mandarin, and Korean. This incredible self-guided tour will automatically translate the main 23-minute documentary into the visitor’s language. Step into the life of a sailor when you visit the USS Bowfin submarine, one of the most celebrated war vessels in United States history. Go underway with a tour of this vessel and its museum. Here you will learn what it took for officers to patrol the corridors of the sub. Step on board the USS Missouri battleship, or "Mighty Mo," where World War II ended when the Japanese signed the surrender documents. Explore beneath the battleship to see what it took for such a grand ship to operate such massive gun turrets on the top deck. Before leaving Pearl Harbor, visit the hangars of the Pacific Aviation Museum for a unique look at the aviation history of the United States. See the planes of World War II and the new additions that are currently used by the United States Armed Forces. This tour also includes a journey through Honolulu to see royal grounds and historical landmarks of Oahu. The statue of King Kamehameha the Great, ‘Iolani Palace, Kawaiaha‘o Church, and Punchbowl Cemetery are just a sneak peek of what you will see from the comfort of your luxury mini-coach.